02:51 <@peter1138> Probably something something in the window tick refactor. 03:24 <@peter1138> Probably a start/stop command, I guess. 04:18 <Eddi|zuHause> andythenorth: had a chance to test https://github.com/OpenTTD/OpenTTD/pull/7199? 04:18 <Pikka> how did that happen, andythenorth? 04:40 <andythenorth> so how much performance benefit does vehicle persistent storage bring us? 04:55 <andythenorth> flat docks anyone? 05:21 <Eddi|zuHause> i tried to "fix" them, obviously. 05:56 <nielsm> how about that idea I aired a while ago, with industries constructed from multiple buildings, in that the industry provides a bunch of building layouts, and the game then places several of those buildings independently as a single industry? 06:07 <andythenorth> some don't terminate in coast? 06:08 <andythenorth> flowing down from springs, or up from estuaries? 06:11 <andythenorth> are non-straight rivers just some random turns? 06:11 <andythenorth> or is it more complex than that? 06:48 <andythenorth_> how many cargos are there? 07:18 <Eddi|zuHause> how do i add a "WIP" label? 07:39 <@peter1138> got any pics? 08:09 <Eddi|zuHause> is there any sane way to keep my "developer" commit history, while at the same preparing a "public" commit history? 08:53 <Eddi|zuHause> is the build system meanwhile capable of providing an unstripped non-debug binary? 09:01 <+michi_cc> Eddi|zuHause: git rebase -i can go quite a long way, especially if you take some care in preparing the commits and use --autosquash with matching commit messages to help your brain remember. 09:15 <samu> will it think of locks? 09:50 <samu> "Allow company owned stations to serve industries with attached neutral stations"
09:52 <samu> "Industry stations may only serve the industry"
09:58 <samu> "Allow company stations to serve industries with neutral stations"
10:03 <samu> "Company stations can serve industries with neutral stations"
10:09 <samu> "When enabled, industries with attached stations (such as Oil Rigs) may also be served by company owned stations built nearby. When disabled, these industries may only be served by their attached stations. Any nearby company stations won't be able to serve them, nor will the attached station serve anything else other than the industry"
10:14 <Eddi|zuHause> no. i'm out to destroy all Samu's work, remember? 10:15 <@peter1138> Make locks great again. 10:17 <Eddi|zuHause> Why is TileHeight() returning uint but GetTileZ() returning int? 10:19 <samu> who's a FIRS expert? Does https://imgur.com/kaKtlc0 match the setting explanation? 10:22 <@peter1138> Eddi|zuHause, just to mess with you. 10:29 <samu> no english experts around? 10:32 <andythenorth> Eddi|zuHause: allow rivers to terraform? 10:34 <samu> what about the name of the setting? 10:35 <samu> needs another name? 10:43 <andythenorth> Eddi|zuHause: is there any concept of the river path after the tiles are placed? 10:43 <andythenorth> for all branches? 10:57 <supermop_Home> Eddi|zuHause: forests yes - high voltage transmission lines seems like too ambitious for the spec? 10:58 <supermop_Home> field would have to be able to be defined to have extreme aspect ratio, and means to prevent the radius from filling with power lines? 11:00 <Eddi|zuHause> one of the problems was always: what happens when the parent industry is gone, but the fields have not decayed yet. who provides the graphics? 11:02 <LordAro> also, did no one write a forum/news post? 11:04 <LordAro> it's a little confusing..
11:04 <@planetmaker> it's accurate though. 11:32 <andythenorth> snail_UES_: what settings do you have for cargo age period on pax coaches? 11:34 <samu> isn't OpenTTD CI (linux commit-checker) usually fast? 11:35 <snail_UES_> I thought it would make a difference over long distances only...? 11:35 <Eddi|zuHause> andythenorth: 128km/h vehicle across 1024^2 map? 11:38 <+michi_cc> I have absolutely no idea how one would make a news post nowadays, so somebody else would have to do that. 11:40 <@peter1138> aww tablet running out of juice. 11:47 <nielsm> so, should probably do something about the network version string for betas? 11:50 <samu> no intro game competiition? 11:54 <samu> 64 rail types, seriously, why? 11:57 <@peter1138> so this is what i get? 11:58 <@peter1138> increase limits because people found it wasn't enough, and then you mock it. 11:59 <+michi_cc> samu: Yes, we reverted that commit just for you; or rather LordAro simply forgot to list it in the changelog. 12:00 <@planetmaker> or did you mean the changelog shipped with the release? 12:00 <+michi_cc> LordAro: So, wait for TB or break the website ourselves? The website readme says 'After tagging, it will move to production.'. Do we dare? 12:01 <+michi_cc> planetmaker: I mean the full changelog on the website. 12:01 <+michi_cc> I guess tagging here means make a GitHub release, as I see several from TB already. 12:02 <+michi_cc> That would imply making a clone first. 12:03 <@peter1138> You don't need to fill it out. 12:05 <@planetmaker> samu, but that means they should learn about shared orders, no? 12:06 <@peter1138> is the ai api capable of that? 12:10 <TrueBrain> where exactly what? 12:10 <@planetmaker> OpenTTD/website --> how do I release the website? 12:12 <nnyby> https://github.com/OpenTTD/website/tree/master/_posts -> Create new file to make a news post? 12:26 <supermop_Home> that just makes the window smaller? 12:31 <nielsm> hmm I should be able to create a tag locally in git, without any risk of it getting pushed, right? 12:47 <LordAro> andythenorth: michi_cc: what was the result of #7109? 12:47 <LordAro> frosch123: have you reached #7000 on your list yet? 12:49 <TrueBrain> will we have a cake party at 10000? 12:50 <nielsm> actually, what _would_ the revision number have been on svn by now? 12:51 <LordAro> based on the fact that https://github.com/OpenTTD/OpenTTD/commits/master?after=4d5d21be7668ae90d6f3c916ad754b719b2f2af5+500 is "+500"
12:57 <LordAro> Eddi|zuHause: #7049, want to remove the 4 codechange commits? 12:59 <@peter1138> i'll look. on mobile atm. 13:02 <@peter1138> Eddi|zuHause, why does it have sorting changes? 13:07 <Andrew350> So the changelogs for beta2 are showing 2018 for the year instead of 2019...not sure if I needed to post an issue for that or just let you guys know in case it was missed? 13:07 <Eddi|zuHause> Andrew350: damn this Obiwan guy. 13:10 <@peter1138> We don't have any time limits for it. 13:12 <Eddi|zuHause> wasn't it 3 months? 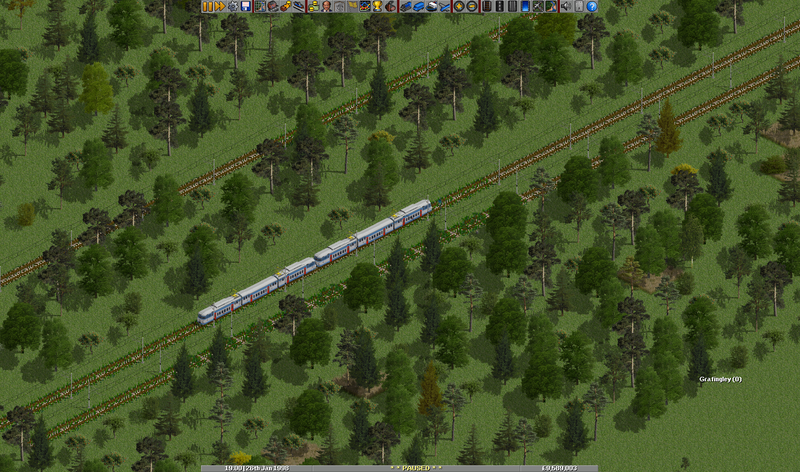 13:17 <+glx> https://github.com/glx22/OpenTTD/commit/3646bcb18941693762d08e77a03edfcf78821f20 <-- good idea or not ? 13:19 <Eddi|zuHause> glx: wouldn't it make more sense to trigger these from the makefile? 13:27 <LordAro> samu: not unless you can give a better reason than "you really should reconsider this"
14:17 <@planetmaker> https://devs.openttd.org/~planetmaker/patches/ship_lost.png <-- I wonder though. Every time the ship leaves Kiel and goes to Dresden, it is briefly lost. Why? 14:17 <@planetmaker> It's a straight line and I don't expect it to get lost in the not too big river network there. 14:21 <@planetmaker> any description necessary? 14:21 <TrueBrain> wtf is that for a tag? 15:18 <FLHerne> planetmaker: > I don't think that it's a new issue really triggered by this patch. 15:21 <FLHerne> Even a very small ship will be stuck on the shore, no? 15:25 <@planetmaker> that's the branch we want to queue? 15:33 <@planetmaker> TrueBrain, you have docker build the images from the CompileFarm repo, right? 15:52 <@peter1138> Current master doesn't compile for me. 15:52 <TrueBrain> who broke it?! 15:54 <@planetmaker> well. My goal is to create images the/a CF can make use of. But these images are build by dockerhub, aren't they? 15:55 <@planetmaker> ok, how are they created? 15:55 <@planetmaker> just on your machine? 15:55 <@planetmaker> with the definitions as found in the repo? 15:57 <@planetmaker> but where *are* the actual images? 15:57 <@planetmaker> they're not re-created every time, are they? 15:59 <@peter1138> LordAro, but this warning is valid. 16:02 <TrueBrain> do you want to build OpenTTD, or something else? 16:04 <@peter1138> I think the OS X build will fail. 16:05 <TrueBrain> put that in a folder, run: docker build -t test . 16:54 <samu> do I need to do anything about 6926, or is it fine? 16:56 <samu> in-place comments? other structure, like how? 17:34 <@peter1138> Hmm, if we only count PRs, we're at 397. Long way til 10,000. 18:05 <@peter1138> But... I dunno. 18:10 <@peter1138> I looked at the "files changed"
18:11 <@peter1138> This PR really benefits from looking at the individual commits. 18:29 <@peter1138> I thought I'd blown up NRT then. 18:29 <LordAro> reflog to the rescue? 19:31 <@peter1138> samu, that may be enough to work, but I don't have a big savegame to test. It doesn't affect loading existing saves, at least. 19:42 <@peter1138> Nah, I've gone to bed now.